John Bayliss, General Manager at Lucerne House Care and the team stand outside their ‘Outstanding’ home. 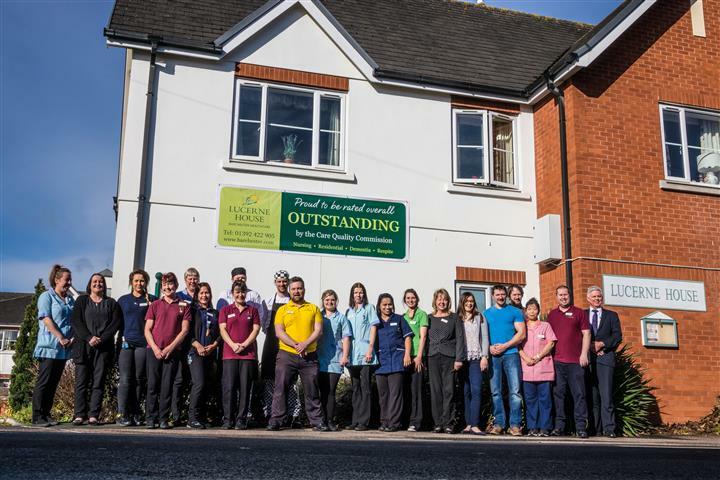 Lucerne House Care Centre in Alphington, Exeter passed a recent Care Quality Commission inspection with an overall “Outstanding” rating after being praised for a safe, effective, caring, responsive and well-led service. Currently only 1.1% of England’s care homes, domiciliary care agencies and hospitals have an overall “Outstanding” rating so Lucerne House has been ranked among the best in the country for the quality of the services it provides. The CQC inspected the home on 21st November and 1st December (the report was released on 8th February) and rated the home, run by Barchester Healthcare, as “outstanding” in four key assessment areas and “good” in one key assessment area. The news comes just as the home has begun further work to ensure the services they provide are ahead of the game by working alongside one of Barchester Healthcare’s Dementia Care Specialists to introduce a new dementia care programme called ’10-60-06’. The 10-60-6 dementia programme was developed and trialled by the Dementia Team at Barchester Healthcare, a care provider with over 200 homes across the country. It will replace the company’s current dementia care programme in order to ensure the care services provided Barchester’s Memory Lane Communities for people living with dementia are the best in the sector. John Bayliss, General Manager at Lucerne House Care Centre said: “We are ecstatic! The team at Lucerne House work so hard to provide the best possible quality care for everyone who lives at the home and we are so delighted that CQC have rated us “Outstanding” overall. “I’m very proud of the whole team. Everyone played their part and every person is equally important. I really believe that delivering this standard of care is all about having great people who are passionate about the job and strong leaders who lead with enthusiasm”. Caption for image: John Bayliss, General Manager at Lucerne House Care and the team stand outside their ‘Outstanding’ home.